Last fall, at the most venerated of China’s Chan Buddhist monasteries, I found myself watching a young boy race up the stairs of the meditation hall. This magnificent and holy place dates to 742 AD when tea was first planted on the slopes of Jingshan Mountain. The monastery, which once housed more than a thousand monks is being restored to its 11th century splendor. The prayer hall is neither gilded or imposing like the temple it serves. It is a place of quiet – a place for tea from a period considered one of the pinnacles of Chinese civilization. Zhejiang Province is one of the most famous tea producing regions. It is located on the southern coast of China near Shanghai and has an ancient history that dates back more than 5000 years ago and has always been an important part of Chinese history. The beautiful countryside is generally hilly. Less mountainous. More rolling plains and valleys. None of the steep high-mountain terrain. Most of the tea produced in Zhejiang is green tea, of which our featured tea, Long Jing is one. This grows mainly outside the city of Hangzhou, in an area known as Westlake.There are some ancient legends of dragons living in underground caverns that were also sources of water. This area has a such a rich history and culture that, in 1985 the Chinese government secured ten national parks to insure protection of the land and to encourage tourism. Tea tourism in this region is very popular. But another tea is Anji White tea, mainly grown in the Huzhou prefecture. 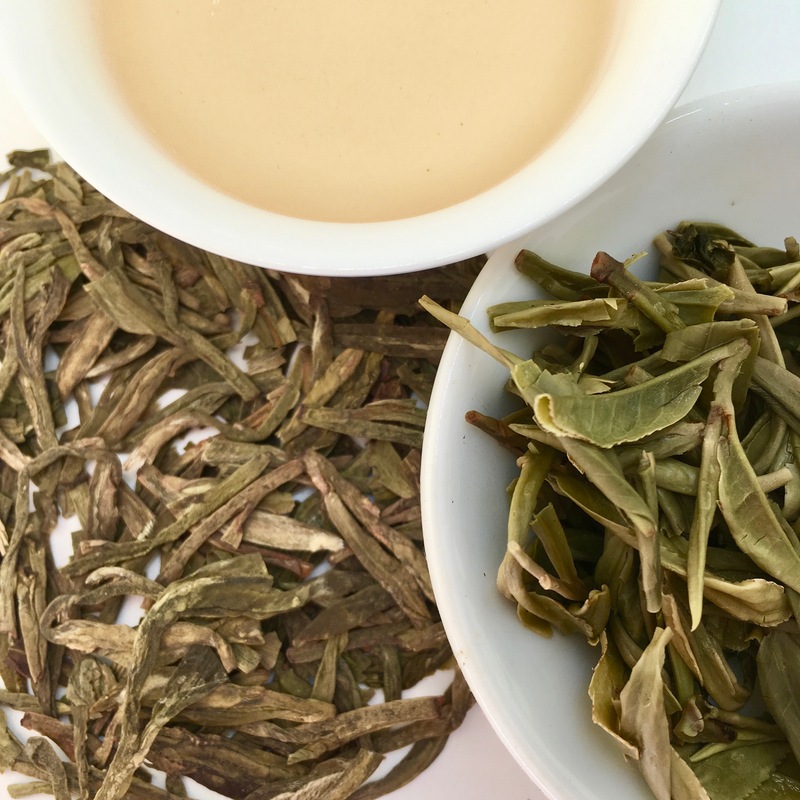 Though it is called a white tea by name because of the lightness, the traditional method of processing would classify it as a green tea. More than 1200 years ago, Lu Yu in his book, Classic of Tea, the area where Long Jing grows and two temples that produced it. Later, in the 1700’s, the emperor Qianlong is said to have been visiting the tea plantations outside Hangzhou. Word came to him that his mother was ill, forcing him to return immediately. Reportedly taking a few leaves with him, he rushed to attend to her. She noticed the fragrance of the tea and requested that he prepare some for her. Her health improved and the temple from whom he had acquired the leaves was granted imperial status. Long Jing is often times referred to as one of the teas of the Emperor’s. Fresh leaves are plucked as tiny buds with only one leaf. It is produced by hand, the craftsmen pressing the leaves against the sides of a wok over a wood fire until the leaf set is dry enough to hold the flattened form. The aroma is often described as having the scent of orchids. Long Jing, Dragonwell, is also known for the ways in which the leaves float in the water as it is brewed. For this reason, many people infuse the leaves in glass gaiwans or tall glass cylinders so that they can enjoy the “dancing”.